I’ve always loved ghost stories, but have never had nerves of steel – which is putting it mildly – and I’ve passed many a long night too scared to go back to sleep after a ghost-story-induced nightmare. Being so easily frightened makes me an ideal reader of spooky stories and I’ve decided to devote a bit of blog space into examining what it is that makes a story scary. This post is going to be a four-parter, put together over the next few weeks, and I’ll conclude in Part IV by looking at some of Muriel Spark’s short stories with a supernatural theme. Part I is about the structure of ghost stories. The attention-grabbing opening: we are thrown right into the heart of things with little or no explanation. We see the ghost/monster/vampire etc. in action and lots of terrified people. 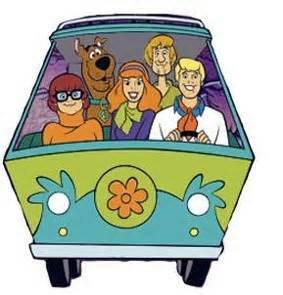 Following a period of development there comes a complication: the Scooby Gang arrive in the Mystery Machine (pictured above) and are filled in on what’s been going on. They split up and there’s a lot of running around before Thelma finds a clue. This is the complication, because it suggests there is an alternative explanation and that the monster may not be what it seems. The climax: following a lot more running around and an elaborate plan which goes a bit wrong, the character we saw very briefly at the beginning of the story – usually the janitor/caretaker – is unmasked and revealed as the villain. The resolution: this is where we get the details, all the Why and the How. Very often we’ll see a clip of an earlier event (a flashback within an otherwise linear timeframe), but this time we witness events from a different perspective, which enables us to see what really happened. And then the janitor/caretaker says ‘I would have got away with it if it hadn’t been for you meddling kids.’ The End. 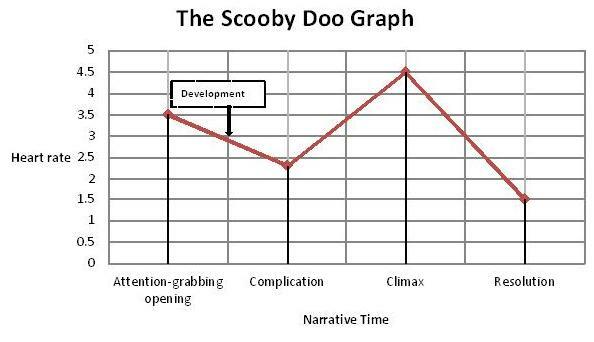 Not all ghost stories follow this pattern, of course. Many stories containing an element of horror or the supernatural finish at the climax, the high point of the story, and when the reader’s level of excitement is at its peak. The stories of Edgar Allan Poe, for example, rarely have a resolution, and end just when the horror is at its most intense. When a short story is structured in this way, the climax is similar to the punchline of a joke: the punchline is delivered at the end of a narrative and the reader is left to fill in the rest of the details in order to arrive at a full understanding of the text. Once the reader has realised the full implication of the man’s words, the response can only be one of horror. I’ll follow up horror stories in miniature in Part II and the reader’s role in Part III, but I’ll finish now with a quick look at how one of Muriel Spark’s stories follows the punchline structure. The story is, of course, The Girl I Left Behind Me. [Warning – spoilers ahead!] The story opens with the I-narrator leaving the office with the tune her boss has been whistling still going round in her head. She catches the bus, all the while feeling invisible amongst the crowd of other tired people returning home for the evening and experiencing a nagging sensation that she has left something behind at the office. When she gets back to her digs, she realises that she cannot bear the thought of the unsavoury repast awaiting her, and the nagging sensation has become so strong now – this is the complication – that she feels she must go back to the office and find out what it is she has left there. She travels on another bus and when she arrives, she finds her own strangled body. The story ends at the climax, with the narrator embracing her body ‘like a lover’. At this point, the reader re-evaluates the narrative in what those who study cognitive poetics term a ‘frame refresh’: now that we know the I-narrator has been a ghost right from the very beginning, we understand how she travelled twice on a bus without paying a fare, why the man whose foot she stood on didn’t react, and why she felt invisible in the presence of other people. We can see that the odd behaviour and dream-like state of Mr Letter, her boss, was in fact symptomatic of his murderous instinct rising, and that he was so fascinated by his tie because it is the murder weapon: the narrator last sees Mr Letter ‘swinging his tie in his hand, beside [her] desk’. The tune she can hear in her head – the tune her boss was singing – is the last thing she hears before she is murdered. The tunes featured in the story have sinister titles themselves: Softly, Softly, Turn the Key, which is what the narrator does first when she enters her digs and again as she re-enters her office, and, of course, The Girl I Left Behind Me, which we now understand in its double sense. Outside the story this is probably the title of a romantic ditty, but as part of the text, Mr Letter has left a murdered girl behind him, and the narrator has left a girl behind her in the form of her murdered body. In Part II, coming soon! – The Horror Story in Miniature.